Everyone is familiar with the blockbuster fantasy Trilogy: The Lord of the Rings; a breakthrough in big-screen entertainment. But now, The Lord of the Rings comes back to the small screen in the form of a vivid and engaging online slot game, developed by Microgaming. Red Flush online casino players, as well as those of Casino La Vida will soon have access to this brand new online slot game adventure, coming to computer screens in early September 2010. The Club Red Gaming group is home to some distinctive brands on the online casino network. Red Flush online casino was the first casino to join this dynamic group, followed shortly by Casino La Vida. Both of these online casinos are waiting in anticipation for the delivery of the latest video slot release from software provider Microgaming; The Lord of the Rings: The Fellowship of the Ring. This game follows the resounding success of The Lord of the Rings Motion Picture Trilogy, and hopes to stir up similar success for online casino players around the world. This agreement has allowed Microgaming the opportunity to develop feature rich online slot games in line with each of the three parts of the Trilogy, all of which will be available to adults in countries where online gaming is permitted. 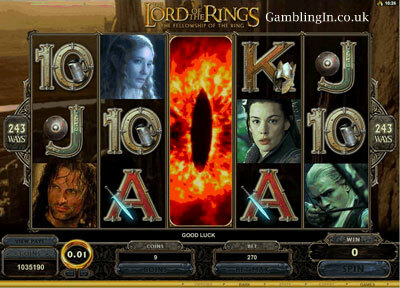 Favourite characters make their debuts onto the online casino circuit, including: Frodo, Aragorn, Saruman and the deadly black riders; along with some of the film’s iconic footage, featuring Ringwraiths during the attack at Weathertop, Balrog in the Mines or Moria, and Uruk-hai in the woods of Middle-earth. Players are waiting expectantly to see what evolves with this release, and with such a stellar cast of characters and the epic subject matter that is The Lord of the Rings; one can guess that great entertainment is to be expected. Find out more by referring to the Red Flush and Casino La Vida websites. Another Progressive Jackpot win with Bet365! Bet365’s Progressive Jackpot games continue to offer big payouts, with yet another lucky winner scooping a massive prize. Games at Bet365 player Vassilis T recently won an incredible £107,808 playing on Alice’s Wonderland, a fabulous five reel, 20-line Slot with some great bonus features. The jackpot was won by entering the Tea Party Bonus Round, in which Alice, the March Hare, the Dormouse and the Mad Hatter drink tea and win players big prize amounts in the process. When sugar is added to any of the characters’ cups, the Progressive Jackpot is won –in this case allowing Vassilis T to enjoy the sweet taste of success and scoop a huge amount of money! Alice’s Wonderland is just one of an extensive range of exciting Progressive Jackpot games on offer at Bet365 Games, giving you plenty of opportunity to play for some incredible prize amounts. Red Flush online casino is proud to announce the fourth edition of the popular online Slot Survivor tournament. This event has always been a highlight on the Red Flush calendar, and it brings with it exciting opportunities to win some impressive prizes. This prospect, coupled with the competitive and fun spirit of the tournament produces an environment for enjoyment and time well spent among online casino players. Friday the 9th of July sees the start of the 4th Slot Survivor tournament at Red Flush and Red Flush Network online casinos (* Red Flush Casino and Casino La Vida). The contest is already open for registration, and players all over the world are registering an “alias” so as to be able to compete in the leaderboard tournament. Great prizes to the value of £40000 are up for grabs, as well as the grand title of "Slot Survivor" – an entitlement that people have fought tooth and nail for in the past. The event is divided into 4 weeks of individual competition, whereby players can play in the casino as often as possible so as to earn points on the leaderboard. Each week, £5000 worth of prizes will be awarded to the top performers and then the slate is wiped clean again for a new leaderboard to start. Must-have electronics, cash, free spins and casino bonuses are up for grabs each week, as well as a shot at being entered into the Top 50 grand final weekend. Each week, a running total of everyone’s points are recorded in the background. At the end of the 4 weeks, the Top 50 overall contenders for the duration of the tournament are entered into the grand final weekend where £20000 worth of prizes can be won. Players can get a full rundown of how the tournament works by consulting the Slot Survivor website. Here they will find updates on the tournament dates; how to earn points as well as what prizes they can expect if they are performing successfully. Even without the prizes, the fourth edition of Slot Survivor is expected to be packed with action and intensity. With only 4 weeks to determine the Top 50, players shouldn’t waste a moment’s time in getting their points on the leaderboard.